Have you seen the elm leaf beetle? Elm trees are an iconic part of the Canberra environment. These beautiful, slow-growing trees have been around since the capital city’s foundation, with many planted by horticulturist Thomas Weston in the 1920s. Over the decades they have grown into magnificent, tall, leafy trees. 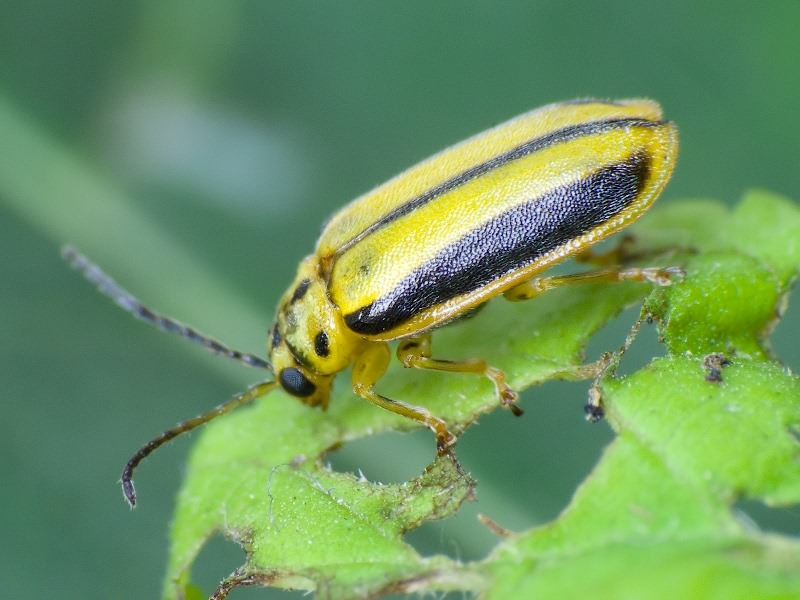 But they are under threat from a new pest: the elm leaf beetle. The elm leaf beetle was first discovered in Canberra in 2010, and numbers are increasing rapidly. The beetle comes out in Spring, crawling (or flying) up to the canopy to lay its eggs. The eggs hatch after just a few weeks, and immediately begin to feed on the leaves until they are completely skeletonised. As the larvae grow and transform into a beetle, they too lay eggs and the process begins all over again. Adults and larvae continually feed on the leaves until the tree is stripped of foliage, extremely weak and vulnerable to disease. Ms Warburton says not enough is being done in the Canberra region to control these infestations, and that a plan is needed to ensure we don’t lose our elms. 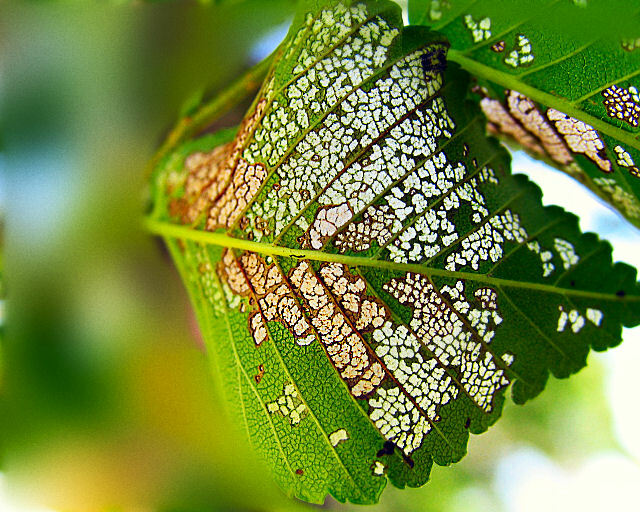 There are a number of ways to treat elm leaf beetle infestations, with trunk injections generally considered to be the safest and most effective method. “Some people recommend trunk banding or horticultural glue and Confidor tablets, but it usually doesn’t work. Banding the trunk doesn’t stop the beetles from flying up to the canopy, and Confidor tablets are harmful to the microbes and worms in the soil. They are also made for small plants and shrubs; most elm trees are huge. Tree stem injections start from $160, depending on the size of the tree. To chat with Ms Warburton about your elm tree, or for a free quote on tree stem injections, call 0414 845 238 or visit Terra Solarus. You’re also welcome to send her a text or email with an image of your elm leaves if you are unsure as to whether your tree is at risk. My (admittedly poor) understanding of the EPA rules is that this kind of thing is regulated when performed as a commercial activity, and I’m by no means advocating people do it themselves, just sharing my experience with the pest. I expect just the cost of the chemical and injectors will put most people off the idea. I don’t believe Silvashield is particularly more hazardous than Confidor, which is readily available. I did briefly consider applying a soil drench using Confidor or Samurai, but it’s not a nice exercise, as it murders all the worms and other critters in the soil where you apply it. The trunk injection seems to have worked well, although there’s a few instances where I suspect the translocation hasn’t worked due to the presence of a major branch above the injection point. Thankyou for your response. I am a little concerned that you are advocating the general public using Silvasheild insecticide. This is a schedule 5 chemical that requires the user to obtain qualification in chemical use as well as being a registered user with ACT government EPA to apply chemicals of this schedule in private or public land. While I agree with you that the government should address this issue more seriously, it is a job that should be left for the qualified and insured registered professional. If there is more than one tree to treat we do provide discounts. Our elm trees had been coping OK with the leaf damage, but the hot summers started to take their toll. We did try banding trunks with a product called Tanglefoot which is a “horticultural glue”. While it frustrated the bugs’ (and crawlers’) commute up and down the trunk, as mentioned in the article, the little bastards just fly up instead. I’ve read of people successfully DIY trunk injecting with Confidor, but chose to use SilvaShield, which I think is the same active ingredient, but designed to translocate more readily when injected into the trunk. With about 10 fairly large elms to treat, it was more or less cheaper to purchase a kit. With fewer trees a contractor would probably be a cheaper option – we did have a fellow from Treelogic come out and he was very knowledgeable, but with so many trees to treat it turned out to be the more expensive option. We’ve treated a few of the elms nearby on public land, but it is something the government should start to address.